ITALY Learns about the American Continental Congress & Revolutionary Politics Raynal, Guillaume homas François. Storia dell'America settentrionale. Venezia: dalle stampe di Antonio Zatta, 1778. 8vo (19 cm; 7.5"). 2 vols. in 1, of 3. I: iii, 288 pp. II:  f., 294 [i.e., 298] pp.  Guillaume Thomas François Raynal (1713–96) wrote his seven-volume account of the European colonies in the East and West Indies with the help of the coteries of philosophes whose salons he frequented: Indeed Diderot is credited with the authorship of up to a third of it, and Holbach, Pechméja, and Paulze also contributed. This Italian translation is of Books 17 and 18 of the original seven-volume work (first published Amsterdam, 1770, and an anonymous continuation); dealing strictly with North America, it has much to say about the political turmoil of the English colonies, the Continental Congress, etc., but also about Canada, native Americans, the border regions of Florida and Louisiana, and French interests. Salt, Henry. 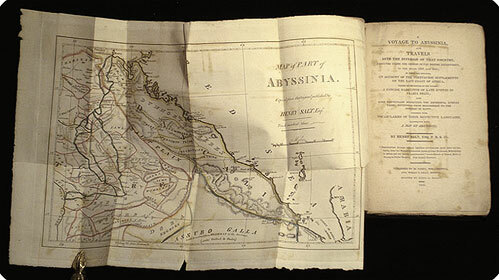 ;A voyage to Abyssinia, and travels into the interior of that country, executed under the orders of the British government, in the years 1809 and 1810; in which are included, an account of the Portuguese settlements on the east coast of Africa .... Philadelphia: M. Carey; Boston: Wells & Lilly (pr. by Lydia R. Bailey), 1816. 8vo (23.5 cm, 9.25"). 24, 454 pp. ; fold. map., illus. Shebbeare, John. An answer to the queries, contained in a letter to Dr. Shebbeare, printed in the Public Ledger, August 10th. Together with animadversions on two speeches in defence of the printers of a paper, subscribed a South Briton. London: Pr. for S. Hooper & T. Davies, . 8vo (21 cm; 8.5"). 179, [1 (blank)] pp. First edition, with two others appearing shortly thereafter. Society History Society of the Cincinnati. Pennsylvania. Proceedings of the General Society of the Cincinnati, with the original institution of the Order.... Philadelphia: Pr. by John Ormrod, 1801. 8vo. 82 pp.  At its founding, The Society or Order of the Cincinnati was composed of the regular army officers who had fought at some length and in specific prominent theaters for American independence, equality, and freedom; future members were to be drawn from among their sons only. By the time that the Society published its second constitution, the Order had changed its membership rules to admit militia and other officers and then their heirsdiluting its elite nature though not renouncing it. This publication demonstrates that change among many others, as it traces the Society via its own documents from its founding at the "Cantonment of the American Army, on Hudson's River, 10th May, 1783," through the incorporation of the Pennsylvania branch, to the death of Gen. Washington. Included here are the by-laws of the Pennsylvania chapter.